Door stop alarm with included batteries provides a fast, simple way to protect rooms from unauthorized entry. Easy-to-set-up design does not require any wires or complicated installation for virtually immediate use. A powerful, 120-decibel alarm quickly notifies you when the door is opened and helps scare off intruders. Compact construction is convenient enough to take anywhere you go. Soft, tacky rubber base stops any door even when used on very slippery floors. Wedge-shape prevents doors from opening for added security. 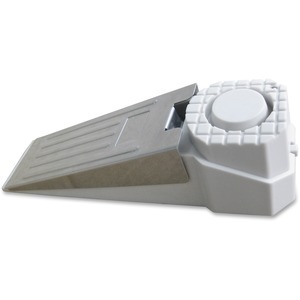 Door stop alarm is perfect for use in hotel rooms, dorm rooms, apartments, offices and more.